Today's card uses quite a few dies and a new die technique that I just learned. I wanted to show it to you too. But first I want to give you a link to the original instructional video. It is such a great idea - and so simple!! Click here for the link. It is on the PaperTrey Ink blog which I read daily. So the technique involves tracing the die with a glue pen to make a border around a die cut piece. Then glitter is sprinkled over the glue. I didn't have a glue pen, but I DID have an embossing pen. And I wanted the border to be on the inside of my die cut piece. So I used the Spellbinders Long Rectangle die to cut a mat for my dress form. I left the piece in the die and used my embossing pen to trace around the inside of the die. Then I removed the die and sprinkled on black embossing powder. Then I used a heat gun to dry it. I was so excited when it turned out well. Now I have a black shiny border on the inside of my mat. LOVE IT ! I still thought I needed another mat so I used the coordinating scalloped long rectangle. The large scallop on the left of the card is cut from a MFT Stamps border die. 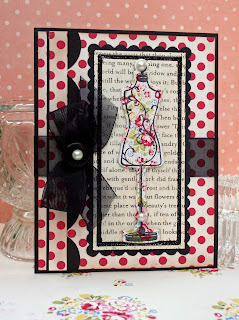 The dress form is also from MFT Stamps. There is a stamp set and a die. The set is called Sew Nifty and you can see it here. I plan to use this set over and over. Can't wait to show you what else I figure out to make. 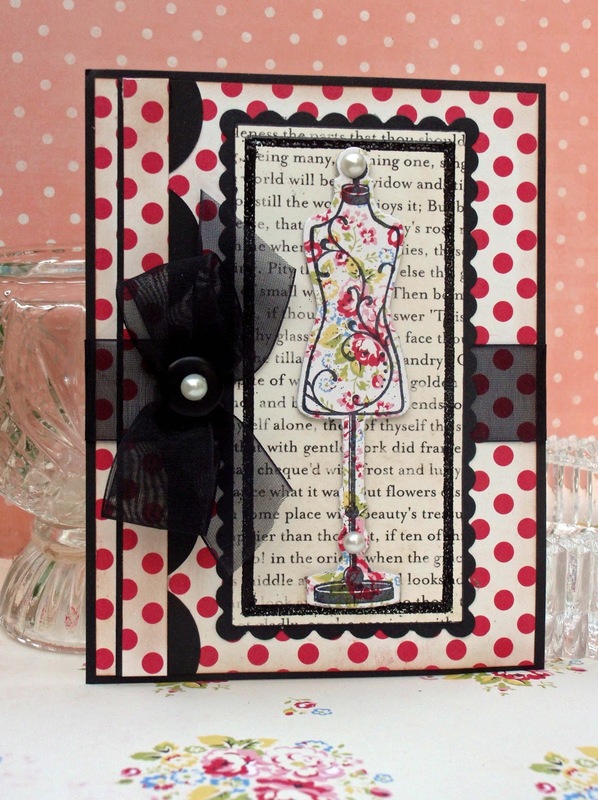 The rest of the card is made from bits and pieces of my stash - buttons, pearls and ribbon. It's one of my favorite combos! I will be back tomorrow.....but not with a sewing card this time.